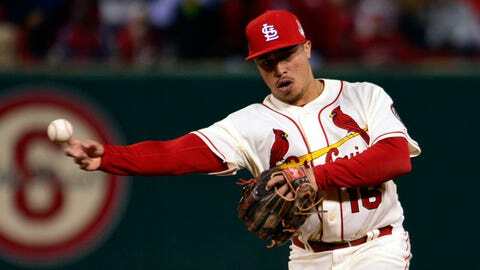 The Cardinals hope to rely heavily on Kolten Wong at second base next season. "His consistency stands out," said director of player personnel Gary LaRocque in the team’s press release. "He showed his bat was capable at the next level handling Triple A pitching and bringing speed and defense to the lineup." "He put pressure on himself because he desperately wanted to contribute," Mozeliak said Wednesday at the Winter Meetings. "When you think about when we did bring him up, we were looking for that bounce offensively. That’s always tough to do on a young player." "We still have a high level of confidence that he can play," Mozeliak said. "In the end, dollars drive decisions (of free agents) but opportunity and how much playing time you can get (also is a factor)," Mozeliak said. "It’s hard for us to promise a lot. When they’re looking at opportunity, they know Kolten Wong exists and they know our intentions are for him to play." "He has shown he can hit both a left-hand pitcher and a right-hand pitcher, but when you think about the next step, the big leagues, if there’s a way to give that lineup protection, you think about it," Mozeliak said. "Added depth for Memphis," Mozeliak said of Castro, a six-year minor-league free agent who has been pitching well in the Dominican Winter League (1.29 ERA in eight starts).